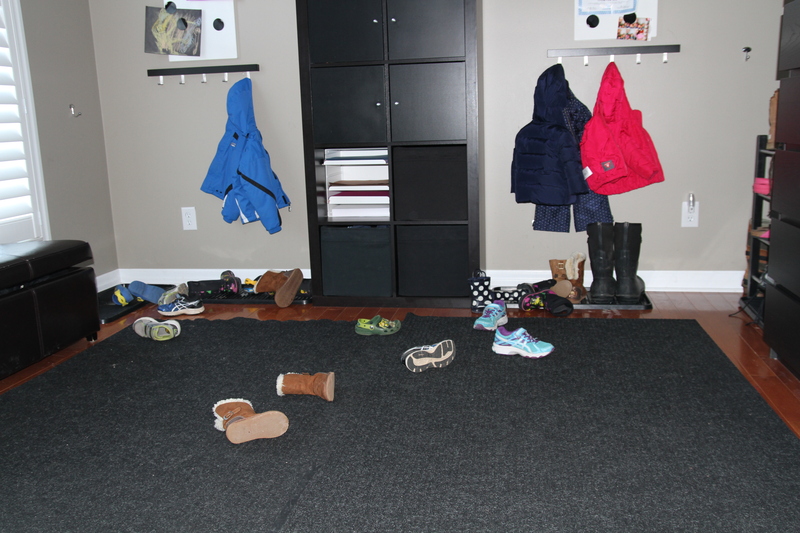 Four kids, each with multiple pairs of shoes/boots/crocs/sandals = a VERY messy mudroom. In order to keep my sanity, I needed to find a home for all these shoes, rather than have them splayed out all over my main floor! 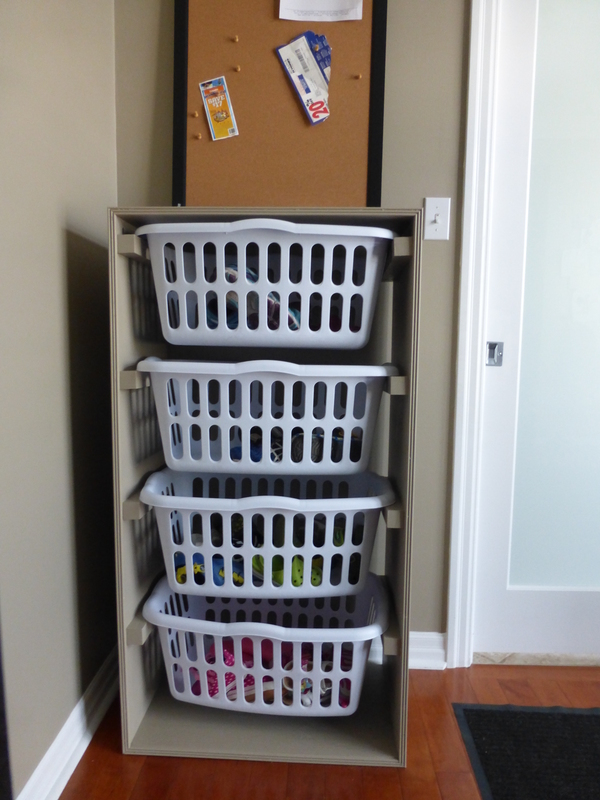 I modified an original Ana White plan ( http://ana-white.com Laundry Bin Stacker) in order to have a basket for each of my kids. I also used a laminated whitewood panel board instead of plywood because it is much cheaper and I didn’t have to wait around to have someone cut down the board for me. 1) Cut wood to size (or have it cut at HD for you) according to how many baskets you want. 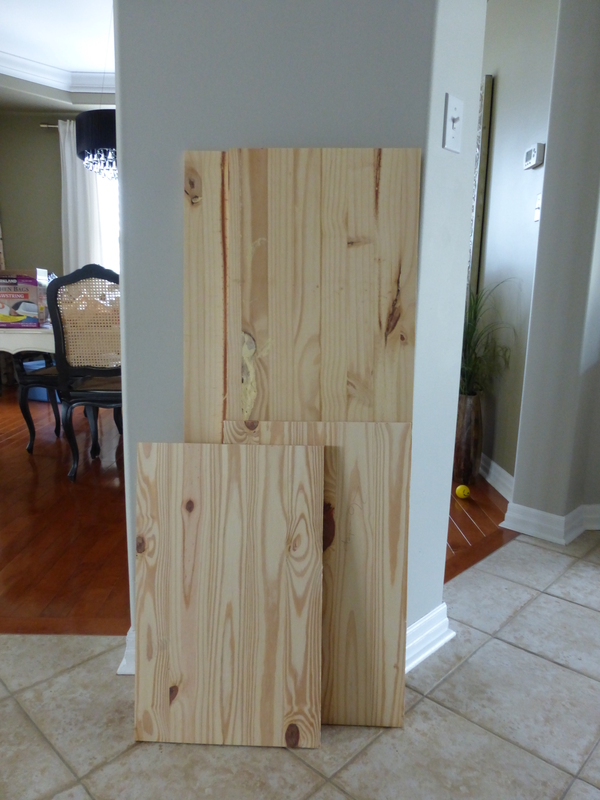 For my project I used the following measurements: top 26″, bottom 24.6″, sides 2 @ 48″ (modified from original plan). 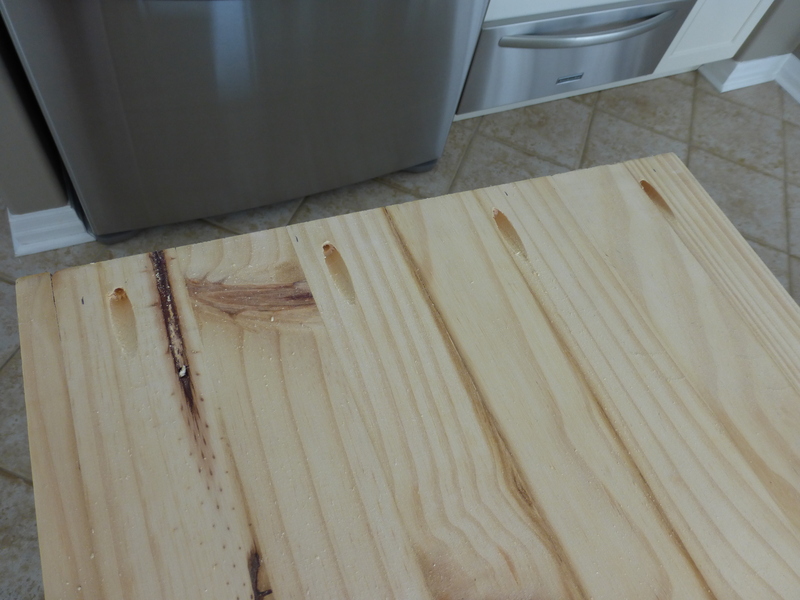 2) Using my Kreg Jig mini, I drilled 1 1/4” pocket holes along the top of the side boards (only top) at approx. every 5” (making sure there was a hole on each side about 1” from the end) and along both ends of the bottom pieces. 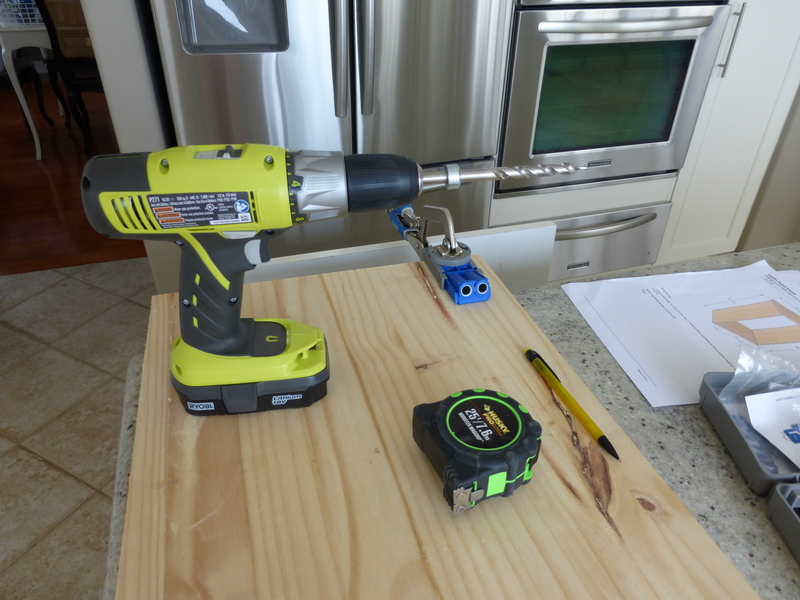 3) Attach pieces together using screws and wood glue. 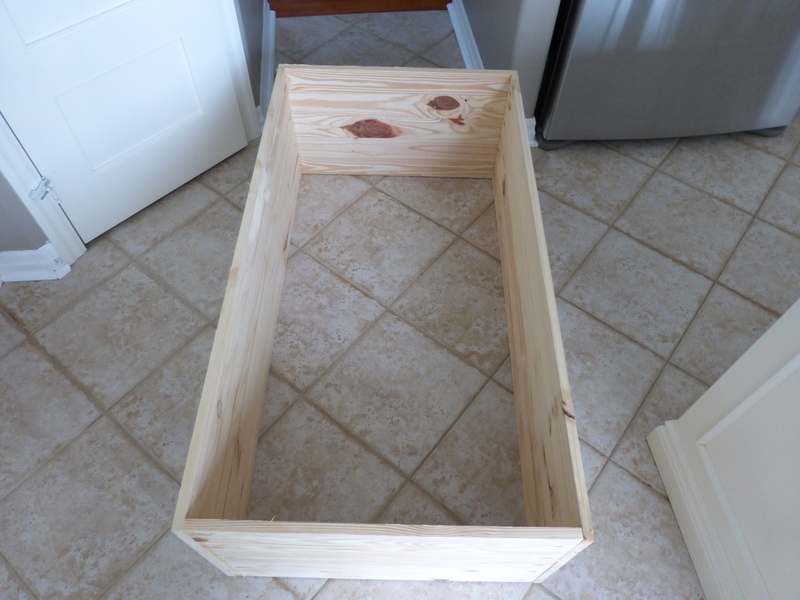 4) cut inner wood ledges (to hold baskets in place) – 15 3/8” each. Pre-drill three holes along length of each piece. 5) Attach at desired height (according to plan), at a slight downward angle from front to back, to ensure baskets won’t slide out, using wood glue and screws. I used a ruler and drew my slightly angled lines for each level, so it was easy to know where to place when I installed. 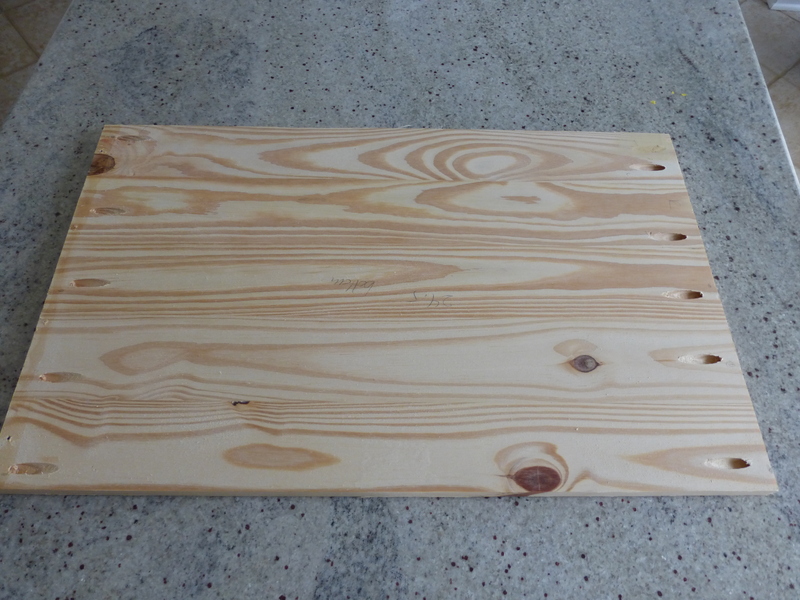 6) Fill holes with wood fill, shellac wood knots, sand and prime. 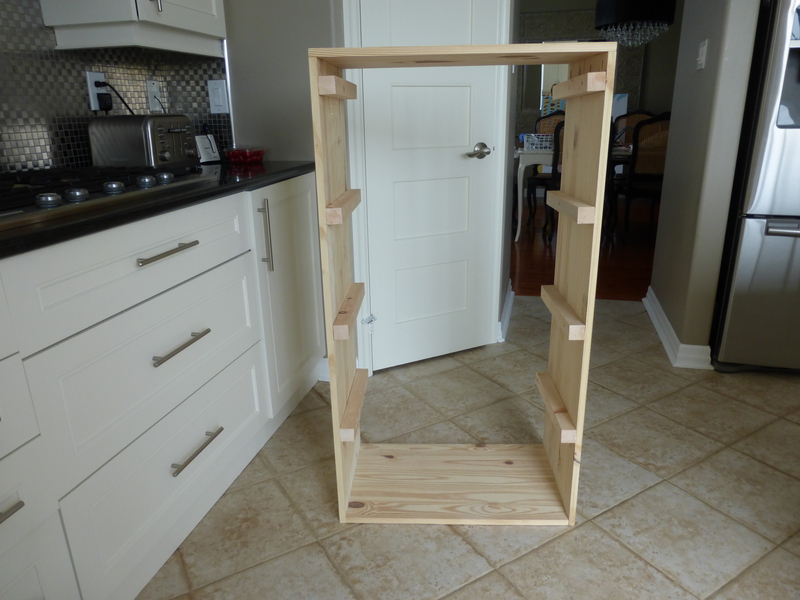 7) Paint entire unit , attach decorative trim to front if you want. 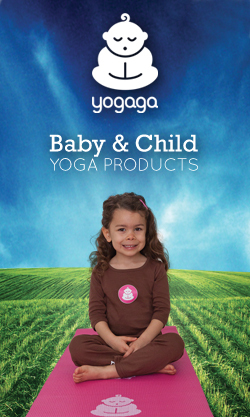 This simple project has worked out amazingly well. Even my 2-year-old knows to put her shoes away in her bin instead of leaving them on the floor!